Paul Klee pochoir "Bildnis mit der Stulpnase (Portrait with Turned-up Nose)"
Medium: pochoir (after the 1920 watercolor). Printed in Paris by Daniel Jacomet and published in 1961 by Heinz Berggruen. The image measures 5 3/8 x 3 7/8 inches (135 x 98 mm). There is another Paul Klee composition printed on the back, as issued. Plate-signed, not hand-signed. Paul Klee pochoir "Haus der Firma Z"
Medium: pochoir (after the 1922 watercolor). Printed in Paris by Daniel Jacomet and published in 1961 by Heinz Berggruen. The image measures 5 x 3 7/8 inches (128 x 98 mm). There is another Paul Klee composition printed on the back, as issued. Plate-signed, not hand-signed. Paul Klee pochoir "Adam and little Eve"
Medium: pochoir (after the 1921 watercolor). Printed in Paris by Daniel Jacomet and published in 1959 by Heinz Berggruen. The image measures 5 3/4 x 3 3/4 inches (147 x 95 mm). There is another Paul Klee composition printed on the back. Signed in the plate (not by hand). Paul Klee pochoir "Bildnis eines Gelben"
Medium: pochoir (after the 1921 watercolor). Printed in Paris by Daniel Jacomet and published in 1959 by Heinz Berggruen. The image measures 5 3/4 x 3 3/4 inches (147 x 96 mm). There is another Paul Klee composition printed on the back. Not signed. Paul Klee pochoir "Gespenst eines Kriegers (Specter of a Warrior)"
Medium: pochoir (after the 1930 watercolor). Printed in Paris by Daniel Jacomet and published in 1959 by Heinz Berggruen. The image measures 5 1/4 x 3 3/4 inches (135 x 96 mm). There is another Paul Klee composition printed on the back. Not signed. Paul Klee lithograph "Klang der Sudlichen Flora"
Medium: lithograph (after the 1927 watercolor). Printed in Paris by Mourlot and published in 1955 by Berggruen. The sheet measures 8 1/2 x 4 1/2 inches (220 x 115 mm). Not signed. Paul Klee pochoir "Stadtebild (City Landscape)"
Medium: pochoir (after the 1921 watercolor). Printed in Paris by Daniel Jacomet and published in 1961 by Heinz Berggruen. The image measures 6 1/2 x 3 1/2 inches (165 x 90 mm). There is another Paul Klee composition printed on the back, as issued. Plate-signed, not hand-signed. Paul Klee pochoir "Kleines Dunenbild (Small Dunescape)"
Medium: pochoir (after the 1926 oil on paper). Printed in Paris by Daniel Jacomet and published in 1961 by Heinz Berggruen. The image measures 4 3/4 x 3 5/8 inches (120 x 83 mm). There is another Paul Klee composition printed on the back, as issued. Plate-signed, not hand-signed. Paul Klee pochoir "Ort am Kanal (Place near the Canal)"
Medium: pochoir (after the 1929 watercolor). Printed in Paris by Daniel Jacomet and published in 1961 by Heinz Berggruen. The image measures 5 1/2 x 3 3/4 inches (140 x 97 mm). There is another Paul Klee composition printed on the back, as issued. Not signed. Medium: pochoir (after the 1940 gouache). Printed in Paris by Daniel Jacomet and published in 1961 by Heinz Berggruen. The image measures 5 5/8 x 3 3/4 inches (143 x 98 mm). 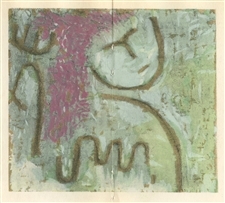 There is another Paul Klee composition printed on the back, as issued. Plate-signed, not hand-signed. Paul Klee pochoir "Unglaubig Lachelnd (Incredulous Smile)"
Medium: pochoir (after the 1933 watercolor). Printed in Paris by Daniel Jacomet and published in 1955 by Berggruen. The image measures 5 x 3 3/4 inches (123 x 95 mm). There is another Paul Klee composition printed on the back, as issued. Not signed. Medium: pochoir (after the 1939 watercolor). Printed in Paris by Daniel Jacomet and published in 1955 by Berggruen. The image measures 5 x 3 3/4 inches (123 x 95 mm). There is another Paul Klee composition printed on the back, as issued. Signed in the plate (not by hand). Medium: pochoir (after the 1930 watercolor). Printed in Paris by Daniel Jacomet and published in 1955 by Berggruen. The image measures 5 1/4 x 3 1/2 inches (132 x 90 mm). There is another Paul Klee composition printed on the back, as issued. Not signed. Medium: pochoir (after the 1940 gouache). Printed in Paris by Daniel Jacomet and published in 1955 by Berggruen. 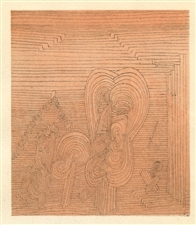 The image measures 5 1/4 x 3 3/4 inches (136 x 95 mm). There is another Paul Klee composition printed on the back, as issued. Not signed. Medium: pochoir (after the 1919 watercolor). Printed in Paris by Daniel Jacomet and published in 1955 by Berggruen. The image measures 5 1/4 x 3 3/4 inches (136 x 100 mm). There is another Paul Klee composition printed on the back, as issued. Signed in the plate, not hand-signed. Paul Klee pochoir "Sollte Steigen (Should Rise)"
Medium: pochoir (after the 1932 oil painting). Printed in Paris by Daniel Jacomet and published in 1955 by Berggruen. The image measures 5 x 7 3/8 inches (132 x 188 mm). There is another Paul Klee composition printed on the back, as issued. Not signed. Condition: this work was issued as a folded sheet with a center crease and stitch holes from the publisher's binding. Paul Klee pochoir "Ruhende Schiffe (Ships at Rest)"
Medium: pochoir (after the 1927 gouache). Printed in Paris by Daniel Jacomet and published in 1959 by Heinz Berggruen. The image measures 5 3/8 x 7 3/4 inches (138 x 198 mm). There is another Paul Klee composition printed on the back. Not signed. Condition: this was issued as a folded sheet with a center crease and there are stitch holes from the publisher's binding. Paul Klee pochoir "Unfall (Accident)"
Medium: pochoir (after the 1939 gouache). Printed in Paris by Daniel Jacomet and published in 1959 by Heinz Berggruen. The image measures 6 1/4 x 3 1/4 inches (160 x 85 mm). There is another Paul Klee composition printed on the back. Signed in the plate, not hand-signed. Paul Klee pochoir "Wenig Hoffung (Little Hope)"
Medium: pochoir (after the 1938 painting). Printed in Paris by Daniel Jacomet and published in 1961 by Heinz Berggruen. The image measures 6 x 6 3/4 inches (152 x 173 mm). There is another Paul Klee composition printed on the back, as issued. Not signed. Paul Klee pochoir "Reisende Vogel (Traveling Birds)"
Medium: pochoir (after the 1921 watercolor). Printed in Paris by Daniel Jacomet and published in 1961 by Heinz Berggruen. The image measures 6 1/4 x 7 7/8 inches (160 x 200 mm). There is another Paul Klee composition printed on the back, as issued. Not signed. Paul Klee pochoir "Trees before the Town"
Medium: pochoir (after the 1919 watercolor). Printed in Paris by Daniel Jacomet and published in 1955 by Berggruen. The image measures 4 1/2 x 3 3/4 inches (115 x 100 mm). There is another Paul Klee composition printed on the back, as issued. Signed in the plate, not hand-signed. Condition: the right margin is narrow. Wassily Kandinsky original woodcut "Improvisation 7"
Medium: original woodcut. (Catalogue reference Roethel 124). This woodcut was printed by XXe Siecle on Arches paper (posthumous printing). Image size 7 1/2 x 5 inches (190 x 125mm); the total sheet measures 12 x 9 1/2 inches (310 x 240 mm). Signed by Kandinsky in the block (not by hand). Condition: there is discoloration in the margins, as shown in the second photo. Medium: engraving (after the woodcut). 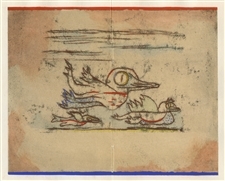 Executed by Kandinsky in 1913 for his famous portfolio "Klänge"; this impression was printed in 1951 for the deluxe art revue Derrière le Miroir (issue No. 42). The image measures 2 3/4 x 5 1/4 inches (70 x 156mm). There is text printed above the image and on the back, as issued. Signed in the plate (not by hand). 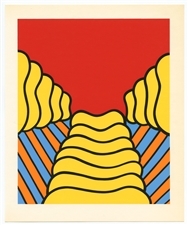 This serigraph / silkscreen (after the original) was printed in Munich in 1973 by Rolf Simons. Image size: 7 3/4 x 6 1/4 inches (image); total sheet measures 9 x 7 1/2 inches (total sheet). Not signed. A rich, colorful impression! Medium: pochoir (after the 1923 watercolor). Printed in Paris in 1959 by Jacomet and published by Heinz Berggruen. Image size: 4 1/4 x 3 3/4 inches (110 x 98mm). There is another Kandinsky composition on the back, as published. Signed in the plate (not by hand). Condition: the left margin is narrow and there is minor wear along the left edge of the sheet. Medium: pochoir (after the 1929 oil painting). Printed in Paris in 1959 by Jacomet and published by Heinz Berggruen. Image size: 5 1/2 x 3 1/2 inches (140 x 90 mm). There is another Kandinsky composition on the back, as published. Signed in the plate (not by hand). Wassily Kandinsky pochoir "Zwei Vertikale"
Medium: pochoir (after the 1930 watercolor). Printed in Paris in 1959 by Jacomet and published by Heinz Berggruen. Image size: 3 7/8 x 7 3/4 inches (97 x 197 mm). There is another Kandinsky composition on the back, as published. Signed in the plate (not by hand). Medium: lithograph (after the drawing). Published in 1958 especially for the cover of deluxe art revue XXe Siecle (issue No. 10 "L'Ecriture Plastique"). Sheet size: 12 3/8 x 9 1/2 inches (315 x 243 mm). Not signed. Condition: as this was the actual cover, there is minor wear. Medium: lithograph. From the "In Memory of My Feelings" portfolio, printed in 1967 on Mohawk Superfine Smooth paper in a limited edition of 2500 and published in New York by The Museum of Modern Art. Signed in the plate, not by hand. Alex Katz was one of the New York artists invited to contribute original compositions in homage to poet Frank O'Hara (1926-1966) for the "In Memory of My Feelings" project in 1967. Size: 12 x 18 inches (there is a fold in the middle and a Frank O'Hara poem incorporated into the composition). Since the full sheet is a bit large for our scanner, the photo shows most but not quite all of the composition. 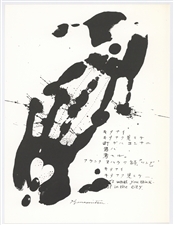 Matsumi Kanemitsu was one of the New York artists invited to contribute original compositions in homage to poet Frank O'Hara (1926-1966) for the "In Memory of My Feelings" project in 1967. The lithograph itself is 12 x 9 inches and the entire sheet is 12 x 18 inches (there is a fold in the middle and the poem is on the right side). Since the full sheet is a bit large for our scanner, the second photo shows most but not quite all of the composition. 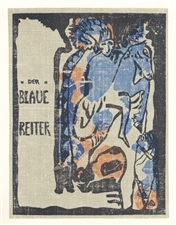 Wassily Kandinsky lithograph "Der Blaue Reiter"
Medium: lithograph (after the woodcut). 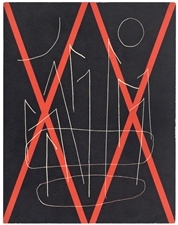 Printed in Paris in 1962 for the front cover of Derrière le Miroir for "Der Blaue Reiter" issue (No. 133-134) and published by the atelier Maeght. Image size: 11 3/8 x 8 1/2 inches; the sheet size is 15 x 11 inches (380 x 280 mm). There is printed text above the image, as published. Signed in the plate (not by hand). Medium: lithograph (after the woodcut). Printed in Paris in 1962 for the back cover of Derrière le Miroir for "Der Blaue Reiter" issue (No. 133-134) and published by the atelier Maeght. Image size: 5 3/4 x 4 1/4 inches (150 x 110 mm); the sheet size is 15 x 11 inches (380 x 280 mm). There is text on the back, as issued. Signed in the plate (not by hand). Medium: engraving (after the woodcut). Executed by Kandinsky in 1913 for his famous portfolio "Klänge"; this impression was printed in 1951 for the deluxe art revue Derrière le Miroir (issue No. 42). The image measures 4 5/8 x 7 inches (119 x 177mm). There is text printed beneath the image and on the back, as issued. Signed in the plate (not by hand). Wassily Kandinsky lithograph "Kleine Welten I"
Medium: lithograph (after the original). Printed in Paris in 1954 by Mourlot and published by Berggruen for a scarce catalogue. Image size: 5 x 4 inches (115 x 100mm). There is another lithograph printed on the back, as issued (the ink from the back shows through the paper somewhat). Signed in the plate (not by hand). Wassily Kandinsky lithograph "Kleine Welten V"
Medium: lithograph (after the woodcut). Printed in Paris in 1954 by Mourlot and published by Berggruen for a scarce catalogue. Image size: 4 3/4 x 4 inches (120 x 100mm). There is another lithograph printed on the back, as issued (the ink from the back shows through the paper somewhat). Signed in the plate (not by hand). Wassily Kandinsky lithograph "Kleine Welten VII"
Medium: lithograph (after the woodcut). Printed in Paris in 1954 by Mourlot and published by Berggruen for a scarce catalogue. Image size: 4 1/2 x 4 inches (117 x 100mm). There is another lithograph printed on the back, as issued. Signed in the plate (not by hand). Medium: lithograph (after the woodcut). Printed in Paris in 1954 by Mourlot and published by Berggruen for a scarce catalogue. Image size: 5 1/2 x 3 inches (140 x 75mm). There is another lithograph printed on the back, as published. Not signed. Medium: lithograph (after the woodcut). Printed in Paris in 1954 by Mourlot and published by Berggruen for a scarce catalogue. Image size: 5 1/2 x 3 1/4 inches (140 x 83mm). There is another lithograph printed on the back, as published. Not signed. Medium: Original Lithograph (in two sections). Published in 1964 by Kornfeld for 1 Cent Life, in an edition of 2000 (along with a limited number of signed proofs). This impression is unsigned. Sheet size 16 1/4 x 22 3/4 inches. 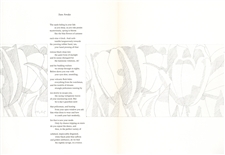 There is poetry text (composed by Walasse Ting) beneath the image and on verso, as issued. Please note: this work was printed on two separate sheets which the collector will join together before framing. The two sheets do not join perfectly -- that is the nature of this format.